Since I like to have a healthy, injury free run I change out my running shoes every 6 months. Over the past 6 months, I have been wearing the Air Pegasus 28 (which I also wrote a review about) and the Nike Free Run 2 (which I reviewed as well) but their shoe lives were up and it was time for a change. I finally had the opportunity to test out the Nike Vomero +6 on a run this afternoon. 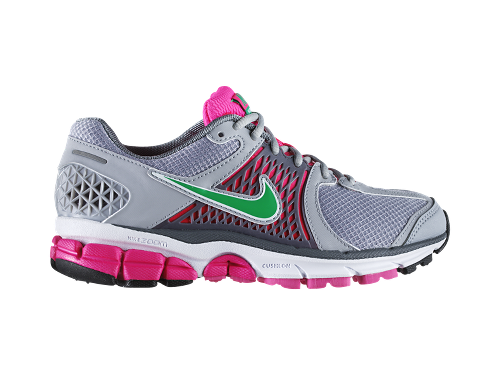 My favorite running shoe was the Nike Vomero 5 so I wanted to feel out the differences in the updated model. The difference: none that I could feel. I felt the same reliability, response and cushion that I had loved so much in the Vomero +5’s. This is great! Size: Fits true to size. I have to go a half size up in other running shoes. Width: Runs wide. The toe box is roomy, cushioned and comfortable. Although I have a narrow foot, I have always preferred a wide toe box. Comfort: Extremely comfortable. I could wear these all day. Durability: I expect these to hold up just as the Vomero 5’s did. Support: Neutral. Since these shoes are so gushy and soft inside, there is a lot of room for error if you’re not a seasoned runner. Overall Grade: A. These are soon to become my favorite running shoes for both the asphalt and the beach. The comfort, control and cushion that I have come to expect from the Nike Vomero Running shoes. Have you tried out the Nike Vomero+ 6 running shoes? If so, how did they rate? Posted on January 23, 2012, in Fashion, fitness, Fitness News, product review, running, shoe review and tagged air pegasus, free run 2, nike, nike air pegasus, nike air pegasus 28, nike free, nike free run, nike running, nike running review, nike shoe review, nike vomero, nike vomero 6, running shoe review, running shoes, running sneaker, shoe review, vomero. Bookmark the permalink. Leave a comment.